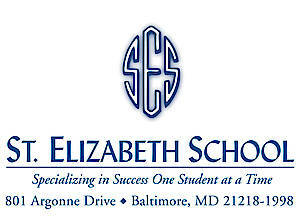 St. Elizabeth School is a nonpublic, coeducational special education Middle and High School located in Baltimore, Maryland that offers a graded diploma program (grades 9-12) and a non-graded certificate program for students, ages 11 to 21.. The 11-month, day school program emphasizes the acquisition of academic, social, and occupational skills in the classroom and in the community. Students who complete program requirements earn a St. Elizabeth School High School Diploma or a Certificate of Completion from their local school system. A caring, professional faculty joins with students and their families to create a unique and effective learning environment that promotes academic growth, personal independence, and mutual respect. A rich network of community relations benefits both St. Elizabeth School and the community. When a student is referred to St. Elizabeth School, the Local School System sends a packet of Information that may include educational, psychiatric and psychological evaluations, speech/language assessments, occupational/physical therapy assessments, transcripts, social histories and discharge summaries from prior placements. The packet is reviewed by the Admissions Director. Parents and the student are invited to a pre-admission interview. The referral is reviewed prior to the interview by an Admissions team, which includes the Principal, Program Coordinator and Admissions Director. At the time of the interview, parents and student have an opportunity to tour the school and observe classes. Any conditions of acceptance for admission are discussed and agreed upon with the parents and student at this time. Students may be admitted to St. Elizabeth School at any time during the 11-month school year. St. Elizabeth School does not discriminate on the basis of race, color, creed, gender, nationality, or ethnic origin in student placement or programming.